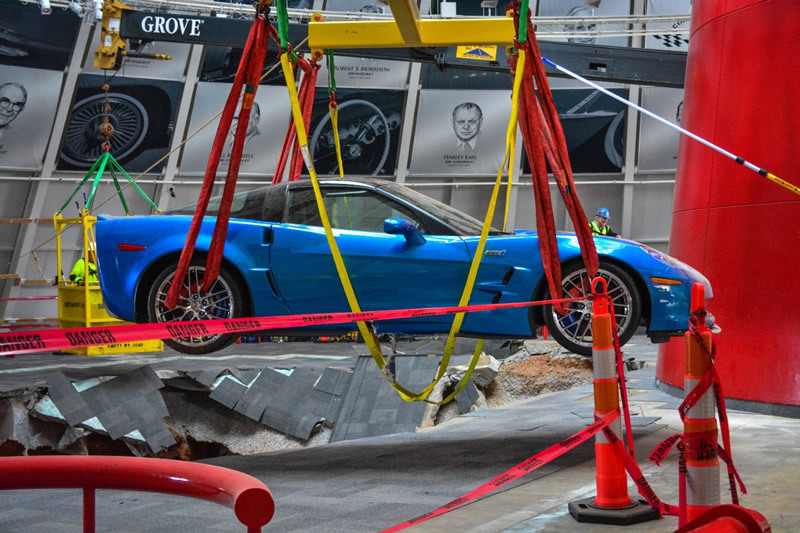 BOWLING GREEN, Ky. – Chevrolet and the National Corvette Museum will restore three of the Corvettes damaged earlier this year when they tumbled into a sinkhole that developed beneath the floor of the Museum. Chevrolet will restore the 2009 Corvette ZR1 prototype, known as the Blue Devil, and the 1-millionth Corvette produced – a white 1992 convertible. In addition, Chevrolet will fund the restoration of the 1962 Corvette, which the National Corvette Museum will oversee. A restoration shop has not yet been determined. In total, General Motors will provide nearly $250,000 in support to help the Museum recover from the sinkhole. The National Corvette Museum celebrates its 20th anniversary this weekend. The five other Corvettes swallowed by the sinkhole will remain in their as-recovered state to preserve the historical significance of the cars. They will become part of a future display at the museum. It’s a sentiment echoed by Corvette enthusiasts from around the globe. Timelines for the start and projected completion dates for the three Corvettes’ restorations have not been established. They will be announced later. On Wednesday, Feb. 12, 2014, at 5:44 a.m., National Corvette Museum (NCM) personnel received a notification from their security company about motion detectors going off in the Skydome area of the museum. When those personnel arrived on site, a sinkhole was discovered, measuring about 45 feet wide, 60 feet long and up to 30 feet deep. Security camera footage showing the Skydome floor’s collapse has been viewed nearly 8.3 million times on YouTube. On March 3, the 2009 Blue Devil was the first car recovered and despite significant damage was started and driven out of the Skydome. The 1.5-millionth Corvette and Mallet Corvette were the last cars pulled from the sinkhole, on April 3 and April 9, respectively – after workers were initially unable to find them amid the collapsed earth. All eight cars were placed in a special display, fueling a nearly 60-percent jump in museum visitor traffic in the first four months after the sinkhole appeared.